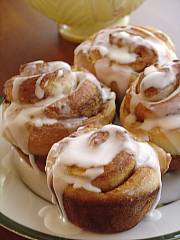 Marie Beesley, who's been a farm wife for 53 years, shared this sweet recipe (with Hometown Cooking Magazine) that will remind you of cinnamon rolls, yet prettier! In a large bowl, dissolve yeast in warm water. In a small saucepan, combine sour cream, granulated sugar, shortening, and salt. Heat and stir over medium-low heat until warm (120°F to 130°F/48°C to 54°C) and shortening is almost melted. Stir in baking soda. Stir sour cream mixture and egg into yeast. Stir in as much of the flour as you can. Turn dough out onto lightly floured surface; knead in enough of the remaining flour to make a moderately soft dough (3 to 5 minutes total). Cover and let rest for 5 minutes. Grease twelve 2 1/2-inch (6.35cm) muffin cups, set aside. On a lightly floured surface, roll dough into an 18 x 12-inch (45cm x 30cm) rectangle; spread with softened butter. Combine brown sugar and cinnamon; sprinkle evenly over dough. Roll up, starting from a long side; seal seam. Slice into twelve 1 1/2-inch-wide (4cm-wide) pieces. Place each bun, cut side down, in a prepared muffin cup. Cover and let rise in a warm place until 1/4 to 1/2 inch (0.635cm to 1.27cm) above top of cups (about 45 minutes). Combine powdered sugar and enough water to make an icing, of drizzling consistency; drizzle over rolls. Serve warm. 1). If baking sour cream buns in a dark colored or nonstick muffin pan, bake buns at 375°F (190°C) instead of 400°F (200°C) for 12 - 15 minutes. Check buns for doneness at 12 minutes into baking. When done they should be a medium golden brown color. 2). When ready to make icing, place parchment paper, or waxed paper underneath cooling rack to prevent your counter from getting sticky from icing the rolls. After baking, buns may be cooled, wrapped, labeled, and frozen for up to 3 weeks. To reheat, wrap buns in foil. Heat in a 325°F (160°C) oven for 30 minutes. Prepare icing, and drizzle over warm rolls. Serve warm.